With wild weather and sunny conditions over the weekend the finals on Sunday were going to be tough ask the team of thirteen drivers. Jobe Stewart and Emerson Harvey were the first representatives of the Melbourne Kart Centre Team in the oversubscribed KA3 Senior Light field. Stewart after a good weekend jumped away in the final and was battling at the back end of the top ten in an ultra competitive field. Stewart drove the wheel of his FA Melbourne Kart Centre backed entry to make a couple of late passes to come home inside the top ten in a highly respectable eighth place for some good championship points. Emerson Harvey was also looking for a promising result after being as low as fourteenth in the final was on a strong fight back and burst his way into the top ten and was up to as high ninth looking for a strong result. Unfortunately trouble struck Harvey in his fight back and he had a unfortunate DNF to finish the weekend. 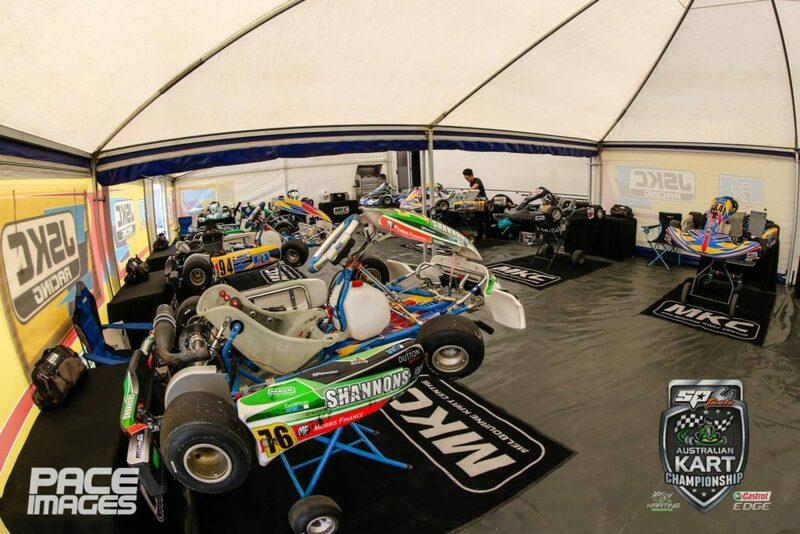 Cadet 12 had young chargers Jack Webster, Miley Miller and Cadel Ambrose under the Melbourne Kart Centre banner but unfortunately it was a tough weekend for all three drivers. While all three drivers showed glimpses of pace and strong results throughout the weekend they all had unexpected bad luck as well and neither of the three drivers were able to make the oversubscribed final with Webster coming home position forty four, Miller position forty six and Ambrose in position fifty five with plenty of work to do for the next round of the series. KA4 Junior Light had another three Melbourne Kart Centre drivers Marcus Pisani, Caleb Sumich and Jake Santalucia looking for a strong result. Pisani was top finisher of the three drivers battling just outside the top ten in the early stages of the final being as low position thirteen. Pisani climb into the top ten at stages throughout the final before dropping just outside the top ten finishing in position twelve. Sumich was at the back end of the top twenty before making up spots and coming back into the top fifteen and finishing in position fifteen. Santalucia had a poor start to the final dropping down to as low as twenty third before fighting his way back into the top twenty and coming home in position seventeen just outside the top fifteen. The tough X30 class had the most Melbourne Kart Centre drivers with five team members taking to the start in the final. Former state champion Morgan Feast put in a fantastic recover drive after being outside the top fifteen in the opening few laps. Feast charged his way back inside the top ten being as high as seventh dropping back one spot to eighth in a great fightback and one of the teams drives of the weekend. Luke Grasso and Lucas O’Brien both moved forward in their finals both finishing just outside the top twenty. Grasso was as low as position twenty nine before making his way back into position twenty two by the finish with O’Brien being as low as thirty seventh before making up ten spots over the race to finish in position twenty seven. Daniel Edmonds and Ray Yu Wang had both made improvement from their starting positions but struck trouble in the final with both not finishing. Melbourne Kart Centre’s owner and former national champion James Sera noted it was a tough weekend overall. “Bit of a tough weekend unfortunately. I thought Morgan’s fight back in the final was superb and Jobe and Emerson both looked strong but we just need to improve that little bit more to be in a winning position for the rest of the series”. Melbourne Kart Centre will next be at the track at the Victorian Kart Championships at the Eastern Lions Kart Club on April 13-14.